Had an absolute blast catching up with Thomas Jones (aka @Niketown588) last week along with social media cohorts @LenDevanna and @ThomLytle. Check it out and let us all know what you think! 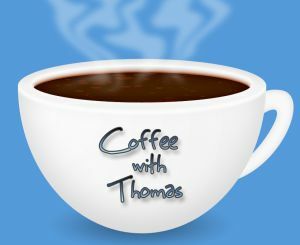 You can subscribe/listen to Coffee With Thomas via iTunes. Join EMC in the Social Space! I read a very interesting white paper this week “The Global Social Media Check Up” by the folks at Burson-Marsteller, a global PR and communications firm, regarding a study they did assessing social media use at the largest 100 companies in the Fortune Global 500 index, and it was very good news indeed, which is why I’m sharing it with you! It is time for companies to embrace, not fear, emerging media. There is no other way to remain competitive. Their study takes a look at these companies use of specific social media tools – Twitter, Facebook, YouTube and corporate blogs – all things that I evangelize for and develop use cases, best practices and guiding principles at EMC, so this study was of keen interest to me. Amazingly, of the companies included in the study, a whopping 79% of them are engaging in at least one of the social media platforms mentioned previously! What did surprise me about the study was that only one-third of the companies were using corporate blogs to reach their audience. This number was much lower than my expectation for blog engagement, although if one takes into account the time and effort commitment to sustain a blog, it’s not such a surprise. Still, I was thinking the number would be at least 50% of companies, if not higher. The other surprising corporate blog statistic for me was that the utilization of corporate blogs is higher in the Asia-Pacific companies at a rate of 50% of the companies having blogs, than the 34% in the U.S.
Twice as many companies overall use Twitter to engage with their audience, which is not all that surprising to me, as Twitter is relatively easy to sustain given character limits – short and sweet is easier than what’s expected (although certainly not required) for lengthier blog posts. The beautiful revelation about Twitter use is that companies are responding and retweeting others and engaging in genuine dialogue. It’s all too easy for a company to simply use Twitter as nothing more than another broadcast channel without actually retweeting or engaging with their followers, but the study shows that is not the case with these companies! Yay! What I would like to see across these companies is a more balanced reciprocation of following those that follow them on Twitter. In their summary deck (embedded below) Burson-Marsteller states “[companies] are taking the initiative to follow others, building a more symbiotic relationship with Twitter users” but I do not think that companies are where they need to be with this. Unfortunately, the companies were following less than half of the people that were following them, which still shows a bit of a bias towards a one-way relationship – a huge opportunity for improvement, in my opinion. The neat thing is that of the companies using Twitter, forty-two percent of them are being tweeted about by others, so there’s clearly an interest in engaging with companies on Twitter. The study demonstrates… that simple, responsible engagement in social media can reap big rewards in building relationships with stakeholders online. What is neat to see though, is that 43% of the Fan Pages out there had posts from fans – so when the fans are there, nearly half of them are posting, and considering that the fan page average for these companies is 40,884 (wow!) – this is total goodness! YouTube is a popular venue for sharing content and engaging with stakeholders, with 50% of the companies having a YouTube channel and several hundred subscribers. Shockingly, the average number of views per channel is nearly 39,000 and over half of the channels have comments from viewers! That’s much higher than I would have guessed, and tells me that we are not utilizing YouTube as much as should be at EMC. I have to admit that I laughed out loud when I saw that most companies have multiple accounts on each of the social media tools, but that the averages were so much lower than our totals on each of these platforms – 4.2 Twitter accounts, 2.1 Facebook Fan Pages, 1.6 YouTube Channels, and 4.2 corporate blogs. Oh, how I wish that our numbers were that low! The study also indicates that it was sometimes hard to determine which accounts were “official” accounts versus which accounts were rogue accounts. As Burson-Marsteller indicates, this is incredibly problematic for someone looking to engage with a company on any social platform and encountering many accounts, some even duplicate – the risk is that the person could get misinformation from a non-official account and/or just get frustrated and not try to engage with the company via social media. This only serves to re-emphasize the importance of the work we’re doing now to step back, inventory, and evaluate all of our existing social media presences and re-engineer where we can. I found this study to be very interesting and informative, and I’d recommend it for anyone wanting a better view into the social media activities of the largest Fortune Global 500. It was a great way to sanity check my own thinking, as well as reinforce existing areas in need of much attention and improvement. No single social media tool can stand on its own. For a company that wants a truly effective communications strategy, leveraging multiple social media tools for their individual strengths is required. View more presentations from Burson-Marsteller. ComScore: The 2009 U.S. Digital Year in Review "Social Networking Remains One of the Web’s Top Activities in 2009"
According to comScore's "The 2009 U.S. Digital Year in Review" report nearly four out of five US Internet users visited a social networking site in December 2009. To put that in perspective - nearly 80% of internet users visit social networking sites. Social networking activity now represents 11% of all time spent on the internet in the U.S., making it one of the most popular web activities. In fact, the sub-title of their section on social networking says "Social Networking Remains One of the Web’s Top Activities in 2009." No surprise here. From a social networking perspective, the report primarily touched on Facebook, Twitter, and MySpace. I'm going to focus my thoughts on Facebook and Twitter, since those are two we focus on at EMC, as MySpace really does not reach our target market. Facebook surged to the #1 position among social networks for the first time in May and continued substantial growth throughout 2009, closing out with 112 million visitors in December 2009, up 105% from 2008. I was surprised to see that the average number of minutes people spend on Facebook each day is only 23.7 minutes. That seems rather low to me, but comScore attributes that to the increase in frequency of visits, which could make sense. It just seems to me that so many people are on there so often, how could it only be just over 20 minutes per day? What are your thoughts on this number? Facebook demographics remain relatively split between those over 35 and those under 35, which is also not really surprising to me. Like Facebook, Twitter's visits also surged in 2009, finishing out 2009 with nearly 20 million visitors, up from just 2 million visitors in 2008. Twitter demographics remains relatively split between those over 35 and those under 35, which is somewhat surprising to me because I would have thought the split would lean higher for those over 35. Twitter experienced the largest increase in people aged 18-24, which is also interesting to me, as I've not really seen this shift. I guess that's just my network experience though! I'm very pleased to see that use of these sites continues to grow, especially since we focus some energy on them at EMC. I'd love to see more information on the quality vs. quantity of posts and users. I'd also love to see some information on participant vs. lurker statistics. I'm always curious to know if the folks out on these sites are actually using them, or just perusing and consuming, but not necessarily creating new content. It changes how you engage with folks when they're lurkers vs. creators. How about you? Anything here surprise you? Anything you weren't surprised by? What do you think this means for the future of social media and social networking sites? My personal opinion - it's great to see the growth continue! Is your social networking hurting your personal brand? As we all explore the world of social media and social networking, we cannot forget that we all have a lot of learning to do along the way. Just as different tools resonate with different people, the ways in which the tools are used are all over the board, as well. This is likely no surprise to any of us who participate in social networks regularly. And yet, as users, we often forget how our social networking and social media activities can be perceived by those that do not use them as we do. To assume that the way in which we are using these tools should not be questioned by anyone is naïve at best, and foolish and even detrimental to your career, at worst. I'd offer this piece of advice to remember: Participating in any online social network or public forum is always going to be subject to review and interpretation by others, whether family, friends, current or potential employers. Why? Because it's just that - public. You should not have any notion of privacy if you're participating in public social networking sites. It's wise to always keep this in mind. As a recent example, a co-worker was looking to hire someone to expand their team, but after checking out a prospective candidate online, became turned-off when they went to the person’s Twitter account and saw over 40 postings in the past 24 hours, most of which were not work-related. Admittedly, even to me - an individual quite comfortable with just about all social media tools available - I thought that was a bit much, especially given that many were during work hours. Personally, I have even un-followed people on Twitter who took up my entire tweetstream and seemingly used Twitter as their public IM tool. To me, quality over quantity showcases your talent when using social networking sites, whereas random and frequent brain dumps are not the kind of “conversation” I care to follow. Is there such a thing as too much tweeting? Yes, I think there is – if you’re tweeting (or blogging or surfing Facebook or another social networking tool) with flaming finger velocity and it’s on work time and you’re not even remotely discussing work-related topics or somehow showcasing your talent as an employee of the company, then I think you’re approaching the area of risking folks thinking that you’ve got too much time on your hands. One might argue that if you’re getting your work done, producing high quality work, and not bothering anyone, that it’s no one’s business. I’d disagree. There are many days at work where having someone help me for even an hour would be a huge help. If you’ve got time to send that many tweets, messages, post that many blogs, etc. during work hours, and especially about non-work-related topics, then you’ve got time to help out a fellow co-worker and be a part of the team and showcase your talent to the company in that way. The #1 question you should ask yourself - Would you care if someone else was telling you this? Ask yourself: Would you say this to your manager or a customer? The line-up for the day included big name brands sharing their social media experiences, strategy and advice for using social media successfully. And the folks in attendance literally came from all over the country to witness the event, which speaks of the level of information one can achieve when attending. MC Hammer – Life-long entrepreneur, blogger, tweeter, rapper, and all around nice guy - need I say more? If you missed the live streaming of the event on CNN.com/live on Monday, you can view videos of some of the folks on my YouTube Channel (some also embedded below). Hard to pick a favorite…Of course, I know EMC’s story very well, since I live it every day and am proud to be a part of the force and strategy. Rather than do a play-by-play of the day, I thought I’d summarize the key points by picking a few keywords to describe the ongoing message of the entire day at Gravity Summit. I’d have to say they are listen, learn, engage, and empower. Listen to what people are saying about your brand, whether it’s your personal brand or your company brand. Listen. Listen to what is being said, take it in, and use it as an opportunity to learn. In the opening remarks with Beverly Macy and Rodney Rumford, it was said “even if you’re never going to use social media in your business, you need to know how to listen to what your customers are saying.” I couldn’t agree more. Learn from what is being said by others. There is an unprecedented ability to gain insights into what people are saying about your brand like never before through all social media channels. It’s like having the ability to finally be the fly on the wall we’ve all wanted to be at some point. As Rodney Rumford said “use social media to solicit feedback and be ready for what you’re going to hear – the good, the bad, and the ugly.” Take it as an opportunity to learn how to be a better brand and educate. Negative comments are such a huge opportunity to learn and keep people engaged. And, as Polly Pearson said, if people are complaining, it’s a sign they still care. Empower others to not only find out about your brand via social media, but also empower your employees to use social media in a transparent way. I agree with Gary Vaynerchuk that “social media’s power and potential are massively underrated.” I love Todd Defren’s take on social media: “social media is not about public relations, it's about public relationships […] social media is not about creating something new every day, but leveraging what you already have in creative ways.” It’s all about empowering people to take advantage of the opportunities social media presents to them and using social media to enhance information and relationships as we know them. The only constructive feedback I have is that it seems like people were jumping out of their seats to engage with the presenters a bit more, and at times things felt a bit rushed. So, perhaps having one or two fewer presenters with a touch more time for Q&A would be a good thing? Hard to say for sure, but I’d love to see a bit more interactivity in the summit. After all, social media is about having conversations and building relationships. All in all, a fantastic summit! My first of many, I hope! Kudos to Beverly and Rodney for a fantastic showing and event! A few vids I shot from the event. See more on my YouTube Channel. I was browsing through tweets tagged with the #pcb4 hashtag for this past weekend’s PodCamp 4 in Boston when I came across what I thought was a genius marketing campaign on Twitter for Brookline sushi restaurant Gari Japanese Fusion. These people have worked it out – they locate local events in the Boston area, pick up on the hashtag and then tweet specials and coupons to the attendees around dinner time. It’s absolute genius if you ask me. More restaurants looking to get into using Twitter should take their lead and try to catch the eye of event attendees by tweeting the specials to their event hashtag. Very cool marketing plan that seems to be working out well for them! Can’t wait to try their sushi! When I first heard about Twitter, I could not really understand why I’d even want to use it. I really didn’t see the point in reading or “listening” to everyone’s thoughts on any topic that crossed their mind. And to be perfectly honest, when I looked at the feed of tweets, I really didn’t see anything all that interesting to me, either. So, I sat back and I watched for a while…quite a while, in fact – about 6 months if I remember correctly. I watched, I listened, and I learned from people I knew already using Twitter. I saw the good, the bad and the downright unmentionable. Then I finally took the plunge and joined. Even still at that point and time, I really didn’t “get it.” So, I continued to watch, shared a few tweets of my own, and weighed what Twitter might end up being for me. Then I decided to explore searching on Twitter, and that’s when I really started getting value because I was finding others who had similar interests, and that was cool! I can very easily learn about new interests and topics as well as who’s tweeting about them by searching hashtags or key words. I love that the tweets are all searchable. Twitter is respectful of my time if I manage it correctly - 140 characters is a nice length to receive updates in an easily digestible format. It requires (for proficient users) that people be concise with their messages. It’s easy for me to keep up with people, new interests and topics in real-time in this format. I like that people put their own categories and definitions on their posts. It helps me to understand more context about what they’re sharing and where they’re coming from. I can use Twitter from anywhere I have access – internet, phone, or 3rd party apps such as TweetDeck or TwitterBerry. Twitter users are enthusiastic, to say the least. People who are on Twitter are on there because they want to be there, so they’re generally very happy to engage in conversation. I can leverage the collective wisdom of my network by joining in any conversation or asking questions, and I always get a quick response. There’s no overhead to using Twitter, no crazy downloads, no crazy software updates, it’s just a plain and simple web interface. Put simply, Twitter’s easy to use. So, what about you? Why do you love Twitter? The search for a donor for Nick Glasgow Continues - We need your support! The search to find a matching donor for Nick Glasgow continues. Please use the Twitter tag of #helpnick when posting on Twitter. We've also decided to use the banner graphic above on our future posts to further increase awareness, even for posts not specifically related to Nick. We want to welcome all bloggers (company or affiliation is no matter) to use this banner and to link it back to Mark's blog, where official updates will be posted. As a part of the ongoing efforts, our creative videography department made this video so that others can listen to Len Devanna share Nick's story, as well as the inspiring story of support in folks getting tested for donor matching, even at EMC World!